Caminar's social enterprises advance the social mission and financial stability of our organization. Any proceeds from these enterprises are invested directly into Caminar programs, supporting resilience and wellness in both our clients and our organization. Two of our social enterprises are located in our Butte Region, Sensible Cyclery and Pro-Touch. At the Avenida Apartment complex, Caminar's Sensible Cyclery has been established to sell quality reconditioned bicycles at an affordable price. Bikes are donated from a variety of sources within the community. Then, the residents of Avenida Apartments, along with vocational trainees who receive services from Butte County Department of Behavioral Health, perform the important tasks associated with overhauling, repairing, tuning, and getting the donated bikes ready for resale. The mission of Sensible Cyclery is to recondition and sell quality used bicycles at an affordable price, and by being in business, to provide meaningful vocational opportunities that help our employees reach their fullest potential. Come find your newly refurbished bicycle at Sensible Cyclery's store located at 2505 Esplanade in Chico, CA. Read April's story of how her time at Avenidas Apartments and Sensible Cyclery helped her to build confidence and achieve her goals. Pro-Touch is Caminar's other social enterprise, which, like Sensible Cyclery, is designed and established for people who receive services from Butte County Department of Behavioral Health. Supportive employment trains individuals who are entering the workforce for the first time or have not had a job in several years. Caminar believes that employment is a critical tool for helping people during their recovery process and while working for Pro-Touch, crew members get real-life employment opportunities. 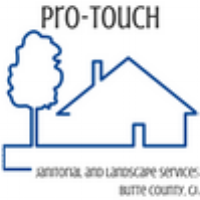 Pro-Touch is not only a vocational training but also a small business that provides low cost janitorial and landscape services for local businesses and people on a limited income. All profits from both Pro-Touch and Sensible Cyclery go back into the programs, creating a double bottom line and giving customers a sense of making a social impact.